How cute is this? This is my first diaper cake! 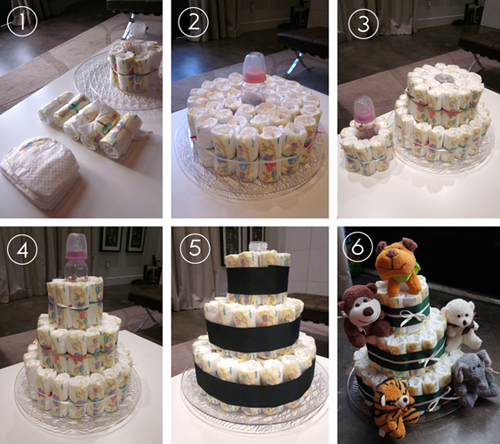 I've always seen them at baby showers but never really knew that you can actually make them yourself. My husband and I are hosting a baby shower for my sister and brother-in-law in Atlanta today. They are doing a safari/jungle theme in their nursery, so they wanted a similar theme for their shower and that is where I got the inspiration for this lovely diaper cake. For the first tier, take diaper and roll up tight about 6-7 diapers. Place a rubber band around the center after you roll each diaper up to hold it tight. Place them around the baby bottle and tie them tightly together with 1/4" ribbon. Next form the second ring with about 13-14 diapers by placing them around the first ring of diapers. Again tie them tightly together with 1/4" ribbon. Repeat this step with the third ring with about 19-20 diapers. If you have patterned diapers like the ones I got, turn the diapers so that the pattern faces the outside of the cake. Now that is the first tier! The second tier is made very similar to the first, instead of 3 rings, you will only have 2 rings of diapers. Part of the baby bottle will be sticking out from the first tier, so place your 6-7 diapers around it to form the first ring. Make the second ring with 13-14 diapers. Now make the third tier around the second baby bottle and tie the diapers around the bottle with some ribbon. Stack the tiers together. Remove the bottle tops from both bottles. Wrap each tier with the 1" ribbon and secure it with a safety pin. Make sure its tight enough to hold up. For the final touches, tie 1/4" ribbon over the 1" ribbon. Then use safety pins to pin the stuffed animals to the ribbons. for a second I thought I read "1 used one" for the 60-70 diapers. I was like.. damn Mel! It must be so fun to host a baby shower! 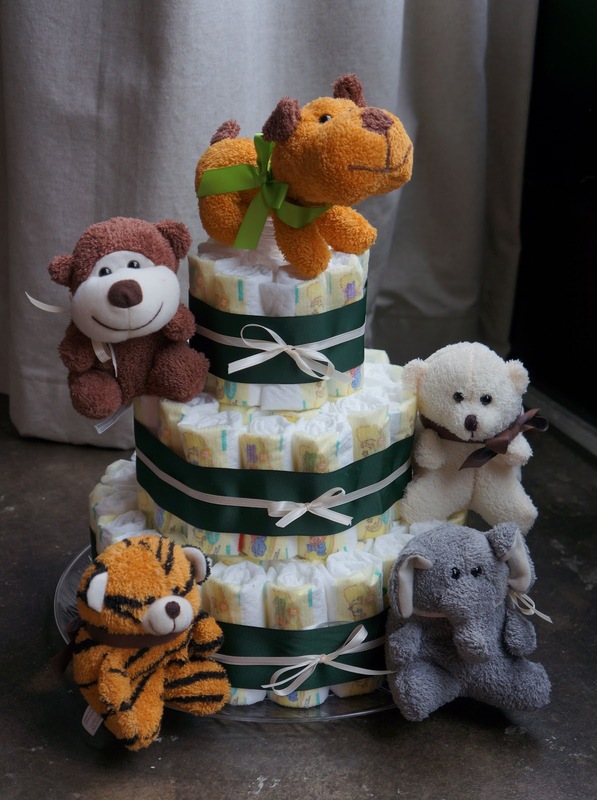 Love the diaper cake, I'm sure that it will come in handy! I love that diaper cake!! It's so cute!! Thanks Stephanie and Catering Atlanta! I like your diaper cake. I like how you used diapers that have prints on them. Most people use just plain white diapers. Also your plush animals are really cute!